An American River College student held a silent protest outside the Student Center on Tuesday in response to an anti-Muslim protest that took place Nov. 17. Burak Kocal, the student who was protesting, said that the anti-Muslim activists who erected a sign that read “Why Islam Kills” in front of the Student Center frightened him. 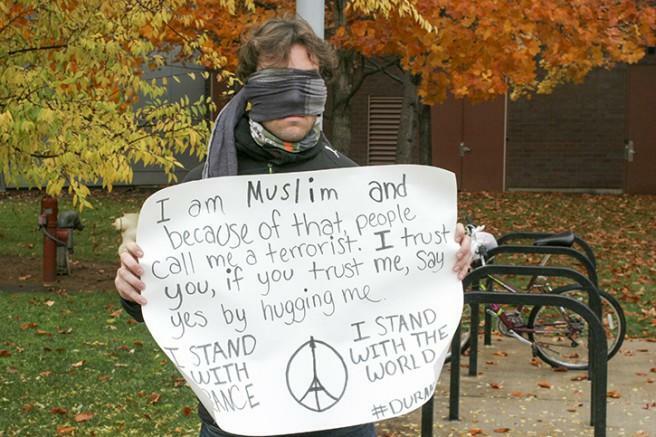 Kocal stood outside during the afternoon with a blindfold wrapped around his head while holding up a sign that asked passers-by to hug him if they agreed that Muslims should be treated with respect. Kocal was joined by his friend, Alex Ramos, a practicing Muslim for 14 years, in his demonstration. “It’s not fair to single out Muslims who are not in mainstream beliefs,” said Ramos when asked about the Muslims involved in the Paris attacks on Nov. 13 that had killed 129 people. When asked if his action would incite an adverse response from students or faculty members, Kocal said that he hoped for only positive responses. While protesting, a police officer was called by a groundskeeper, who was worried for Kocal’s safety after an unidentified person was overheard making a threat against Kocal.The groundskeeper did not give her name, nor was a name given for the person who had made the alleged threat. Kocal’s belief in his Muslim faith is based on the Five Pillars of Islam. Kocal used the term ‘Duranadam’ on his poster with a hashtag. “It’s Turkish which means ‘standing man.’ Duranadam is a symbol for a stance against intolerance and unjust,” Kocal said. ARC student Yara Alfalehan said that negative stereotypes about Muslims are not based in the religion itself. “People practice it wrong, you blame the person not the religion,” Alfaleh said. Kocal said that he confronted Vincent Bradshaw, who was one of the protesters at the anti-Muslim demonstration. “I said to the gentleman that ‘I want to let you know this isn’t the kindest thing to say to people,’” Kocal said. Be the first to comment on "Muslim student protests against anti-Islamic activists"